The Fokker 70 is a medium size twin engined turbofan airliner developed and produced by Fokker as a smaller version of the Fokker 100. The Fokker 70 prototype was basically the second protototype of the Fokker 100, c/n 11243 registered PH-MKC: two sections of the aircraft were removed, making it four meters shorter than the Fokker 100. This plane had three cargo doors, one more than the regular Fokker 70. The size of the Fokker 70 is similar to its predecessor, the F-28 Fellowship. The Fokker 70 PH-MKC was flown first on 4 April 1993. Fokker announced it was developing the Fokker 100 as the successor of the F-28 Fellowship in November 1983. 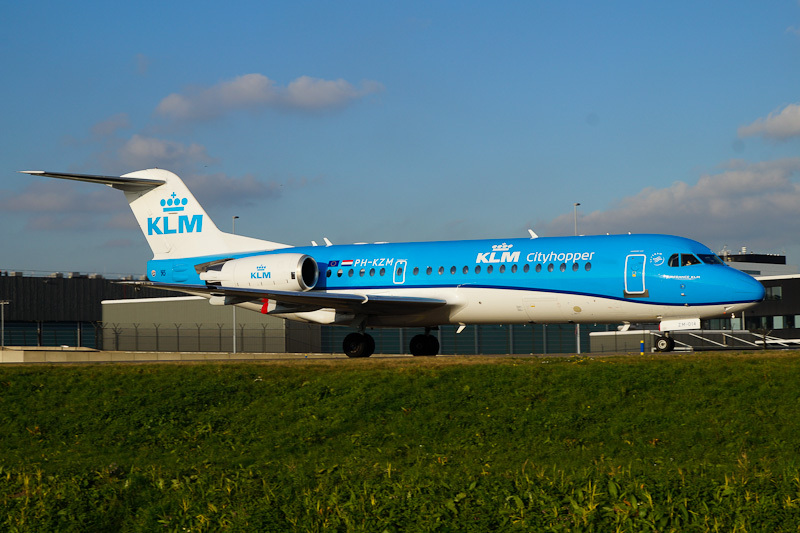 Fokker 100 is the popular name of the aircraft, the official name is F28 Mk.0100. The Fokker 100 is based on the basic airframe of the F-28-4000, but stretched, thoroughly modernised, including a number of key design changes. Improvements includes the economic RollsRoyce Tay 620-15 turbofans, revised wing design with greater span and aerodynamic efficiency and a modern EFIS glass flightdeck. Two prototypes were built, the first flying on 30 November 1986, the second on 25 February 1987. The first production aircraft flew on 5 Oktober 1987 and the certification was granted in November 1987. The first customer delivery, to Swissair, occurred on 29 February 1988. The Fokker 100 was offered in a number of versions including higher gross weight options of the standard airliner, the Fokker 100QC with a large cargo-door on the left side right behind the cockpit and the Fokker Executive Jet 100 corporate shuttle or VIP transport. The design also forms the basis for the shorter Fokker 70, while the 130 seat class Fokker 130 had also been studied. A total of 48 Fokker F.28 Mk.0070 were built, including the prototype that started its career as a Fokker F.28 Mk.0100. Production ended after Fokker collapsed due to financial problems on 15 March 1996. On 27 October 1995, Fokker F28 Mk0070 c/n 11561 was testflown as PH-EZR. The aircraft was destined for British Midland but on 1 November 1995, the airliner was delivered as 9V-SLL to SilkAir, the Regional Wing of Singapore Airlines. On 29 May 2000, the 1995-built Fokker F28 Mk0070 was registered PH-KZM in the Netherlands with Fokker Services BV., Hoogerheide. On 30 June 2000, the PH-KZM was registered with KLM Cityhopper, Schiphol, and is operated on the regional network of KLM Cityhopper since.